Australia and New Zealand are on my list of places I want to visit someday. For some people, they dream of actually living there. I have friends and family who have studied in Australia, are living in Australia and have just migrated to New Zealand. Both countries are ideal places to live because there are more opportunities for work. Plus, these countries embrace different cultures and have low population density. People also speak English . These places are relatively closer to home so it is easier to go home when you miss family and friends. 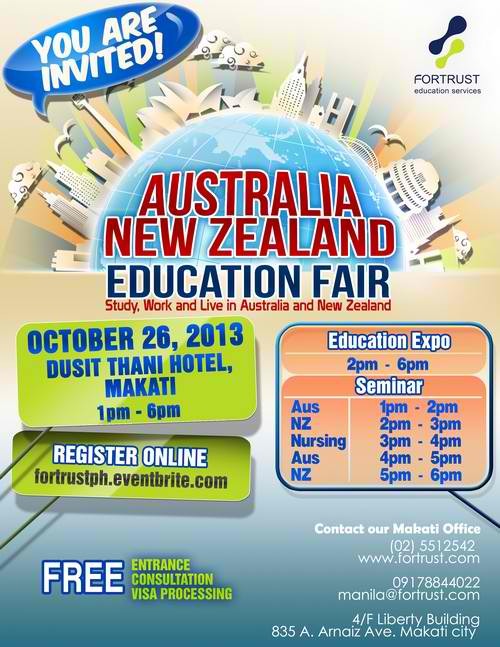 If you have been thinking about a new life in Australia and New Zealand, check out this event on October 26, 2013 at Dusit Thani Hotel in Makati. Registration is free. Make sure to register at www.fortrustph.eventbrite.com to secure a seat at the event. Like their Facebook page to get updates: https://www.facebook.com/FortrustPH. If you know somebody who is interested in this event, click the share button below. Disclosure: I am not connected with Fortrust Philippines. I am writing this for a friend’s friend. Registration to the event is free and it will be in a nice hotel. If you have nothing to do on October 26 and are interested in this opportunity, sign up on the link provided. I hope this gives you opportunities for a brighter future. I encourage you exercise good judgment in making life decisions. Ask a lot of questions. Weigh the risks and evaluate pros and cons. God bless! Looks like they are inviting professionals to live in their country which I think is a nice place too. I would love to go Down Under too. Australia is a fun place to study but to work there is a different matter as unemployment is quite high there too. Australia is a beautiful place and I have some friends living there now and also in New Zealand. I personally have no plans for these places, but for younger persons, this could be an option. exempted ka! saw her last september. i had the chance to visit australia a year ago when the hubby went there for a biz trip. australia is a very progressive place and i could see myself living there with my family if given the chance. This is nice event though we can’t visit the place since we still have works on saturdays and malayo din kasi sa place namin. It used to be in the plan for me to study overseas. Ha ha Oh well… 😉 Might be that late still?